Her Highness Sheikha Moza bint Nasser, Chairperson of Qatar Foundation (QF), has officially opened the Qatar Biobank building in Hamad bin Khalifa Medical City. Accompanied by His Excellency Abdullah Bin Khalid Al-Qahtani, Minister of Health and Secretary General of the SCH; Dr. Hanan Al Kuwari, Chairperson of the Qatar Biobank Board of Trustees; and Dr. Asma Al Thani, Vice Chairperson of the Qatar Biobank Board of Trustees; Her Highness Sheikha Moza unveiled Qatar Biobank’s new state-of-the-art facility at Hamad bin Khalifa Medical City at Building 17. The opening, which took place on the second day of Qatar’s inaugural conference ‘Biobanking in the Context of Personalised Healthcare’ hosted by Qatar Biobank, also comprised a comprehensive tour of the new facility to showcase the various services Qatar Biobank provides its participants. “Biobanking is one of the great healthcare opportunities of our time. Thanks to the visionary leadership of Her Highness, the Qatar Biobank has quickly established itself as the most ambitious of its kind in the region. 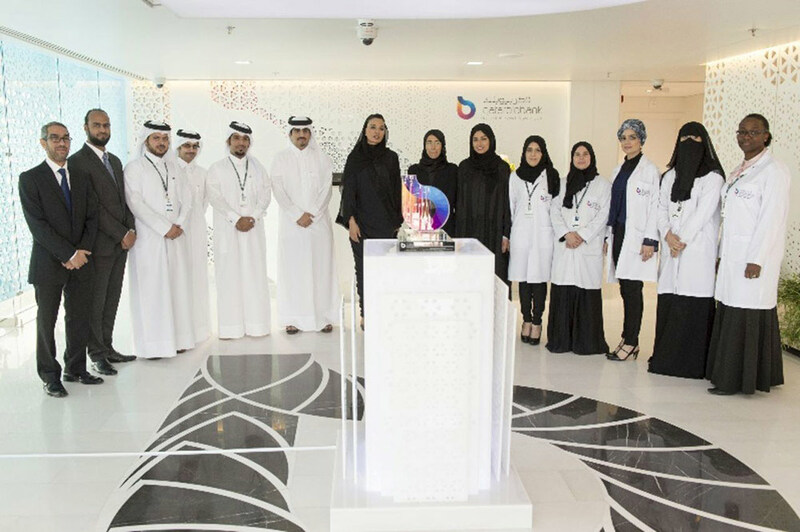 The data from our noble volunteers will be used to help understand how lifestyle, environment and genes affect health locally, and will play a critical role in helping develop treatments and preventing disease for the health of future generations,” said Dr Hanan Al Kuwari. 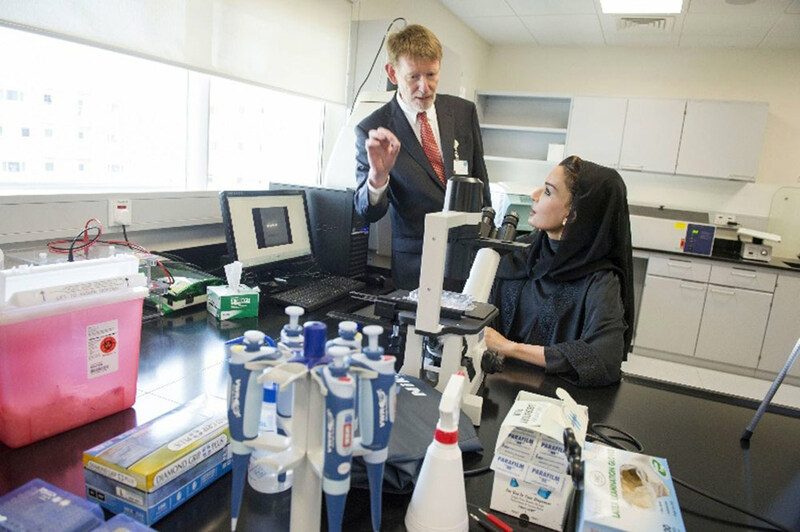 Her Highness also visited Hamad Medical Corporation’s (Hamad) Interim Translational Research Institute (iTRI) to learn more about its ongoing innovative scientific and clinical research programs. Her Highness reviewed the importance of the iTRI facility in nurturing research and enabling the translation of scientific discoveries to aid the development of new medicines, technologies and treatments for better patient outcomes. Her Highness witnessed how through the Academic Health System partnership the medical landscape in Qatar is developing rapidly, underpinned by clinical and translational research and evidence-based care. The Academic Health System initiative is a partnership between Hamad Medical Corporation, Qatar Foundation member organizations Weill Cornell Medical College in Qatar and Qatar Biomedical Research Institute as well Qatar University, Sidra Medical and Research Center, Primary Health Care Corporation and University of Calgary, Qatar. The inauguration of the Qatar Biobank building follows the conclusion of Qatar Biobank’s two-year operational pilot phase, the results of which shed light on a number of findings relevant to the local community, including the fact that 76 per cent of male and 70 per cent of female participants, from a sample of 1,200, are either overweight or obese. Announced by Her Highness Sheikha Moza bint Nasser at the World Innovation Summit for Health (WISH) in Doha 2013, the Qatar Genome Project, a genome mapping of the local population spearheaded by Qatar Biobank, signifies a notable change in future treatment through personalized healthcare. Additionally, Qatar Biobank’s collection of samples and information on the health and lifestyles of large numbers of the national population makes vital medical research possible for scientists in Qatar, the region and the world. With plans to initially collect samples from more than 60,000 participants from the local population, Qatari nationals, or people who have resided in Qatar for more than 15 years, are eligible to participate through the contribution of samples. This contribution involves attending an assessment session at the Qatar Biobank clinic that lasts less than three hours, and comprises the collection of a series of measurements including an individual’s height, weight, blood pressure, and blood, urine and saliva samples. The health information obtained from medical records, DNA, lifestyle, and environmental exposures has the potential to provide further insights into the management and prevention of debilitating diseases common in Qatar.